At the end of last year, I announced an essay writing contest. My goal was to find some quality examples of narrative writing by real students that I could include in my just-published collection of 50 sample college application essays, called Heavenly Essays. About a hundred or so students generously submitted their essays, and most were very well-conceived and engaging. It was extremely difficult for me to pick the winners. What I looked for were students who revealed a part of themselves in their essay by using narrative writing techniques, such as anecdotes, dialogues, descriptive writing, sensory details, an authentic voice, etc. I chose three winners. Each of their essays are included in Heavenly Essays, as well as seven other essays from students who participated in the contest. The other 40 essays were written by my former tutoring students. First Place: Nathan Selinger, Skokie, Illinois. Attending Northwestern, Evanston, IL, this fall. Second Place: Cassandra Pruitt, Syracuse, New York. Attending Williams College, Williamstown, MA, this fall. Third Place: Francis Mejia, Domincan Republic. Attending Indiana University Bloomington, IN, this fall. “Um, now?” I asked the director, praying he was joking. By now, I have had many “transitions to adulthood.” My grandma lovingly shows her friends photos of me chanting Hebrew at my Bar Mitzvah. My closet is stuffed with the blue polos I wore to my first summer job. And I have finally mastered the art of looking cool while driving my little sister around in my mom’s red 2001 Dodge Caravan. However, the community in which I feel I’ve gained true grown-up status is Thespian Troupe #113, the nationally recognized theatre group at my high school. Nearly twenty hours a week, eight shows a year, and countless late nights memorizing lines or analyzing scripts, my friends and I take pride in putting on professional-quality shows that push the boundaries of what high school theatre can be. Whether I’ve been cowering from an onstage school shooting (with a frighteningly realistic gun), showering glitter onto a childhood beauty pageant, or twerking to an all-male a cappella version of “My Milkshake,” every show I’ve worked on has exposed me to new, fascinating challenges. If I had to choose one particular show that marked my theatre “transition to adulthood,” it would be when, my sophomore year, I unexpectedly landed a leading role in the fall play– and had to kiss a girl, onstage, for the very first time. I stood in the rehearsal room, completely flummoxed. I looked at my scene partner, a good-looking junior named Lena who had played the exotic dancer in the previous year’s production of RENT. I took a deep breath, puckered up, closed my eyes, and gave her a hurried half-second mouth-touch. The room went quiet. “We’ll work on it later,” said the director, clearly unimpressed. My face had turned redder than the small smudge of Lena’s lipstick that was now on my lower lip. I quickly turned the page in my script and nervously continued the scene. Now, if this were an offbeat indie rom-com, the story would go a little like this: Using my awkward boyish charms, I (played by Michael Cera) seduce Lena (Zooey Deschanel) into overlooking my awful kissing and starting an adorably quirky romance with me. The truth, though, gets a little uglier. As the rehearsals went by, the director’s notes went from polite (“Pretend you do this every day”) to painfully direct (“Stop looking like you’re molesting her!”). This kind of criticism was something completely new to me. My academic classes got tough at times, but there was always an emphasis on positive feedback and simply “doing your best.” In rehearsals, though, the final product was more important than the process. It didn’t matter that I was trying my best, since my best attempt at kissing still wasn’t good enough for a professional-level show. My cast mates grew even more impatient. I could tell from their expressions after one particularly disastrous attempt that they were starting to smell my blood in the air. Actually, it was probably Lena’s blood in the air, since I had somehow cut her lip with my freshly tightened braces. Hopelessness was setting in. Could I ever get it right? Finally, it was show time. We had only run the whole thing a handful of times before. Backstage, my knees trembled with anticipation. I can’t really remember what happened onstage –it’s a panicked blur in my head– but as we took our curtain call, the audience jumped to their feet with applause. We had done it. I’ve made many more memories in the theatre department, but this one will always hold a special place in my heart as the time when I began my journey to becoming a theatre grown-up. I’ll always cherish the lessons my friends and teachers in theatre have taught me, starting with the universal truth that if at first you don’t succeed, just pucker up and try again. Christmas day at my grandparents’ country house, an elegant pink brick building, once a Quaker meetinghouse, nestled in pristine snowy fields. Inside, a fire blazes merrily in the hearth. Stockings droop, overflowing with chocolate, marzipan, truffles, and trinkets. The tree glimmers with ornaments. Everything is candlelight, old wood and the smell of cloves. The elegant banisters and chandeliers are draped with yards of evergreen garlands. Christmas carols drift from an unseen stereo on the balcony. All around me is Limoge china, gleaming silver, beautiful antiques, blown-glass ornaments, and tarte tatin. My eight-year-old self sits sprawled on the soft Oriental rug in my new Christmas pajamas, surrounded by relatives and mounds of expensive wrapping paper. Presents are given and received, all day. More and more, so many that they cannot be counted: first edition books, cashmere sweaters, collectible dolls, a tiny aquarium, soaps from France, toys from museums. Nothing is enough. Perhaps, over the years, I’ve gilded this memory, lingered over the smell of warming Stollen. But I’ve never forgotten the feeling that for all its glossy perfection and elaborate preparation, this day is only an empty box wrapped in beautiful paper. Unspoken words pile in snowdrifts and resentments hang in the air with the scent of pine and nutmeg. What this charming vignette doesn’t show is the anxiety beneath the surface, the forbidden sadness, the demand that everything must appear absolutely perfect, no matter the cost. My childhood was punctuated by these holidays of “wretched excess,” as my mother jokingly called them. But life with my mother and sister was fun and spontaneous. After school we explored the forests, gorges and waterfalls of Ithaca. We never had a television; every evening we read together, curled up on our tattered yellow love seat. We played board games and visited museums. One winter we used no electricity after nightfall, relying on oil lamps and candles to illuminate our evening piano practice. We grew vegetables in our small backyard and painted birdhouses to hang among the flowers. We perused the OED for new words, then made up definitions for them (scopula: a female scallop). At holidays, instead of shopping, we baked the dozen kinds of Christmas cookies collected in our much-annotated cookbook. We were never wealthy but we were comfortable and happy. I cherished my home life, and the Montessori school we struggled to afford. I had no idea how quickly I could lose these gifts I took for granted. You know the people you see pushing shopping carts along the highway? That’s my family today. We’re the ones who have to put groceries back at the checkout because we don’t have enough money. This year I’m making do with the remnants of old notebooks because we can’t afford new school supplies. I come home to an empty house furnished only with air mattresses and stacks of books. We have no kitchen; all our food is made with a toaster oven and plug-in kettle perched on a cardboard box. The windowpanes are cracked and I study by the light of a bare bulb. Seven months ago, our ancient car broke down for the last time. Since then, we’ve been walking or taking the public bus. You must be wondering how this could have happened. When I was thirteen, my mother’s partner left without a backward glance, leaving behind his Steelers coffee mug and his business debts; the next year my loving grandfather died with an expired will; and my mother’s health problems worsened, leaving her chronically bedridden. In addition to drastic material loss, these momentous changes stripped away my sense of safety and continuity. Untethered from everything that had defined my life, I didn’t feel at home anywhere. I was living on a knife’s edge. It took years, but when my life finally settled into a new shape, despite the countless losses, I had gained unimaginable resilience and perspective. Poverty entails a thousand petty humiliations, but it has also stripped away the nonessential, imparting clarity and uncovering deeper values. We chose to sell our antique silver in order to keep driving the long commute to school. We chose to sell clothes instead of books, our furniture, but not the piano. Looking around this room, everything I see is precious to me: my books, my flute, my running shoes, my schoolwork, my beloved dog, my mug of tea. Equally valuable are my newly developed resourcefulness and perseverance, the new closeness with my little family and my evolving gratitude. I see my past clearly for what it was– the rich opportunities, the glow of security, as well as the dependence on surface perfection. I also see the present, with its unexpected joys and its refrain of uncertainties. Each morning I wake up to unanswered questions, but I feel at home in myself and in my life. *Please note: this essay was submitted for QuestBridge, an organization that helps match high-achieving, low-income students with top colleges, hence the 800-word count. While lying on my bed watching T.V. one night, I thought I had a brilliant idea. I jumped up and walked into my mom’s room, where she was sitting on a couch. We could hear my little brother, Osvaldo, playing Playstation in his room down the hall. “Mom, could you please order us a pizza?” I asked. I couldn’t remember the last time we had our favorite, pepperoni and double cheese. “PIZZA!” my brother shouted from his room, and even left his game to wait for her answer. Slightly annoyed, I raised my voice and started to blame her for not having a job. For “sitting in her room doing nothing every day.” But after hearing all my accusations, my mother with a dismal look on her face started explaining how hard she was trying to get a job. But angry as a raging bull who saw red, I quickly walked away from her room, ignoring every single word that came out of her mouth. My father left the house when I was a little kid, too young to understand, too young to miss. I was raised by my single mother for many years until she married again in 2003. But three years after her marriage my stepfather suddenly died from a brain attack. My mother was really hurt inside but her eagerness to work and never back down regardless of the situation was my reason to smile. However things changed when she broke her ankle and was forced to remain in bed for over a year. This injury caused her to lose her job. Not having a job is no reason to make another person feel bad. In hindsight, it seems like I took all the frustration I had with my father because of his absence in my life and threw it all over my mother. I spent days angry at myself because I couldn’t understand how could I blame my mother for something so dense; for not having a job. But this problem was not just between my mother and me. What about my brother? What example am I giving to him? And the fact that my anger was triggered because of a pizza was even worst. I felt weak. I couldn’t even talk. Not a word. Moments such as those made me the person I’m today. No, I’m not perfect, in fact I’m full of flaws, but the way I see and approach others has changed. Sometimes I used to go to places and rarely greeted people, maybe because I was a little shy. In contrast, now every time I see someone, from the supermarket cashier to the bus driver, I try to make some contact to make them feel more comfortable regardless of their social status or situation. However my mother never let me down. It seemed like she didn’t care about all those words I threw at her. Because after that day she was still there. She was still there preparing me breakfast every morning. She was still there asking me how I felt every day after school. But at that moment I was too blind inside my head to realize what her actions really meant. She showed me how to forgive others and live on without hate. I will be contacting the three winners so they can claim their prizes! If you want to write a compelling, effective college application essay like these, start with my Jumpstart Guide. 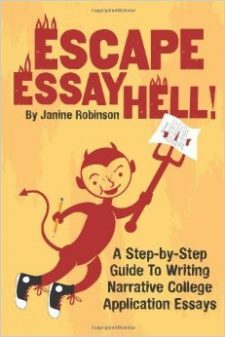 My other book, Escape Essay Hell, also teaches you how to write a narrative-style essay, and was used as a guide for many of the standout essays featured in my new collection. Congratulations to the winners and to all the students for their outstanding work! I’m especially proud of Annie Beier, who, not only is one of my former students, but a perfect example of what happens when you combine ability, effort and passion. Congratulations Annie!